What Can A Tag Sale Teach You About Your Business? 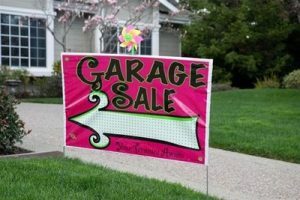 Home/Blog/What Can A Tag Sale Teach You About Your Business? My friend Adrienne is a tag sale aficionado. I always thought a tag sale was “for fun” but now I know it’s a “dead serious sport.” I have been looking for interesting things for my house, pictures, metal frames, fireplace decor and whatever else strikes my fancy. What’s interesting about the sales really isn’t the merchandise, it’s the people who run them and their attitudes. The object of a tag sale is to sell your junk right; these are the things that used to be treasures and now you want them out? I think it’s only fair to bargain with the seller. “How much for a pair of 1950’s earings, a dollar? Fifty cents is more than enough.” Some sellers get really hot with you because you’re trying to get it cheaper; so what’s the problem? Oh, I’m sorry, I didn’t say it right and now you’re insulted? This reminds me of what happens in retail stores; customers want it cheaper and they either ask you to lower the price or they say” it’s too much, I won’t pay it.” Why do sellers take offense? It says nothing about them or their merchandise. The next group of sellers when confronted with the same answers, “it’s too expensive” launched off into the value of the product. I spyed an aluminum teapot that had never been used and could boil enough water for 20 cups of tea! It was a beauty. The woman wanted $20.00 (and worth every nickle) but I told her I thought $10.00 was plenty–at which point Adrienne chimed in with, it’s worth $5.00. The woman didn’t shutter, she told me she found it in granny’s closet and it had never been used. I told her it still wasn’t worth $20.00, I mean this is a tag sale. She again never listened and went off to spin a tale about her grandmother coming over from Italy. Okay, in five minutes I was willing to pay $20.00 if I could retell the story. This woman was obviously a seasoned retailer because she never let up. She was very polite, smiled and continued to say $20.00. I told the woman that I should get a discount since it was a tag sale. To this she replied, it’s really worth $50.00. She definitely had worn me down and assumed I wanted it. She obviously wasn’t insulted or annoyed at me; she did give me a discount. I bought it for $18.00 and got the story for free. Selling is all about negotiation. I want what you have and want to believe your product is worth your price. I would even feel better if I felt like it was worth more than your price. When customers want to haggle, you need a good story I love this blog, How to Haggle Like your old Man. Haggling is just two people trying to make a deal–that’s all it is. Customers need reasons to pay your prices, products are products but stories are priceless. You need to separate yourself from the customer and remember it’s just a game. The next item was a Ralph Loren scarf hanging over a tree; what a find! I triped over the baby carriage and missed my turn. It went for $1.00! It was just a come on, the canoe went for $600.00 but the credibility of the tag sale had been established. Quality stuff for less; she told us the canoe was worth $1000.00. Okay so I haggled over a wicker closet and bought it for $20.00 despite the $35.00 price tag. She didn’t like my haggling but it was beginning to rain and I told her it was my last $20.00 if she didn’t want it she could drag it back into the garage. She begrudingly took my money but made a point to show me she didn’t like my attitude. Then there was the lady with the workout clothes who told me how much she paid for them 5 years ago. The key is “five years ago and worn.” She too was insulted that we didn’t want to pay her price. Adrienne and I found this quite humerous; did she know anyone else that wore a size 0 and needed her old clothes? Why get annoyed at customers that want a cheaper price? It’s a customer’s right to say whatever they choose. I think the problem is that most salespeople don’t know what to say. Immediately they get insulted and turn off to the customer instead of realizing it’s just a game. Maybe the customer won’t buy from you today but they will go away with a good feeling. Why not get their name and email address and tell them if you get something in their price range you’ll give them a call. Call them in a week to find out if they found their price; you never know. Just because a customer acts cheap doesn’t mean they will always be cheap. How about a comeback–if you can find it at that price let me know so I can buy one. Just because a customer isn’t that polite doesn’t mean they won’t buy. No need to be impolite, how about being more polite? Just because a customer is difficult doesn’t mean he won’t buy. Why be difficult back, no need to react. Remember none of this is personal and customer service begins when you understand your customer and and attempt to build a relationship. Great salespeople don’t give up. “Why don’t you think it’s worth the price? Great salespeople know how to take seemingly difficult customers and turn them into friends. Great salespeople don’t take any of this personally. They know who gets the money first wins. Thanks for this article! Working for an independent flooring store, I always hear: too much, not worth it, can it get for 10% off at Lowes, etc. I never thought of looking at it without being intimidated or taking offense! Even if I can’t give someone anything off, if I don’t stay in the conversation, I’ve already lost. I like this perspective!